I wanted to come up with something special for dh's birthday dinner. It was harder than usual to come up with a menu because dd was having a first grade friend spend the night. A picky first grade friend. When I saw the recipe for Chicken Marsala over at Smitten Kitchen, I know that was exactly what I was looking for. Dh and I would love the mushroom sauce and the kids could have their chicken plain with no extra work on my part. Woohoo! I'd been wanting to make Chicken Marsala for quite awhile. In the past when I made it, I usually just used whatever red wine I had on hand. (Not really Marsala, I know.) Recently a new fancy-schmancy wine shop opened up here in town. The first thing I did was ask the owner for a good Marsala. It had been in the pantry for awhile and this was the perfect time to break it out. The recipe was simple and tasty, though it seemed a little more labor intensive than my usual recipe, it wasn't bad. The sauce was a little thinner as well. Since we really enjoyed this dish, I'm including both recipes. Pound chicken between two sheets of waxed paper until a uniform thickness. Combine flour, pepper, and oregano and blend well. Heat the oil and butter in a skillet until bubbling lightly. Dredge the chicken in the flour and shake off the excess. Cook the chicken on medium heat for about 2 minutes on the first side or until lightly brown. When turning the breasts to the second side, add the mushrooms around the chicken pieces. Cook until lightly browned on the second side, about 2 more minutes. Stir the mushrooms. When the chicken is browned, add the wine around the chicken pieces, cover the pan and simmer for 10 minutes. What a lovely meal to celebrate a birthday! And, a bonus that you could make the kid's happy as well - without extra work! 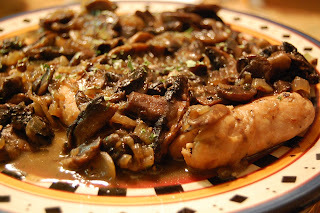 chicken marsala - yes - but you know, I'm sooo not a mushroom fan at all - lol. looks good though. You have a winner here and it's the mushrooms that give this dish character.